Russian President Vladimir Putin has signed a decree imposing economic sanctions against Turkey after Turkey shot down a Russian warplane. Entering into force immediately, the presidential decree said a ban of charter flights from Russia to Turkey will be introduced, and Russian tourism operators should stop selling tour packages to Turkey. 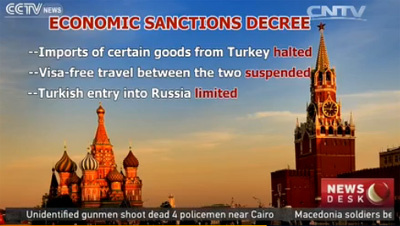 Also, Turkish transportation companies shall be restricted in their operations in Russian territories, while the import of certain goods from Turkey will be halted. The visa-free travel regime between Russia and Turkey is also formally suspended and Turkish citizens, except Turkish diplomats and their dependants and those with temporary permits of residence, are not allowed to enter Russia starting Jan. 1, 2016. The decree spoke of the need to protect Russia's national security and Russian citizens from criminal and other illegal activities./.